On September 25, Iraqi Kurds voted overwhelming for independence. A 93% majority spoke for itself, Kurdish officials calling the results binding. Turnout was around 80%. Voting was easy, enforcing the results another matter entirely. Baghdad followed through on its threat to send armed forces to the region in the country’s north, bordering Turkey’s southeast. They seized Peshmerga-controlled territory near Kirkuk, continuing their advance, capturing the area’s K-1 air base. Clashes erupted between Kurdish and government forces in Kirkuk’s industrial zone. Iraqi Afaq TV said army troops took control of Kirkuk’s airport and area oil fields. War rages. The Pentagon downplayed heavy fighting, deplorably calling it “coordinated movements, not attacks” – a “misunderstanding.” Kirkuk is a battle zone likely to worsen. On Sunday, Kurdish authorities refused to annul the referendum’s results, pledging to defend the region. Kurdish officials denied the presence of PKK fighters in Kirkuk, just some volunteer sympathizers there, according to General Jabar Yawer. 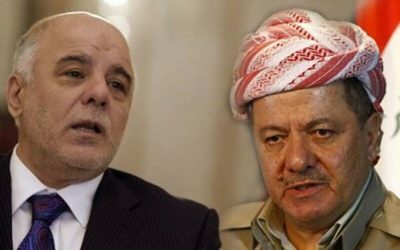 Barzani ordered Peshmerga forces to resist advancing Baghdad troops. Fighting continues for control of Kurdistan. In 2014, Peshmerga fighters liberated Kirkuk from US-supported ISIS. Kurdish authorities maintained control since then.